First I want to start saying Cardigans and Necklaces has now reached its 100th post! This is really special to me because it just shows how much I’ve been able to do since the beginning of the year. I also want to be able to thank all the people who follow me and leave comments. I ask that you keep leaving more comments so I can continue to grow and get better with my writing. Also leave comments on what you would like to see on my blog and I might even make an article about it. I’m so excited to continue posting and writing my articles. 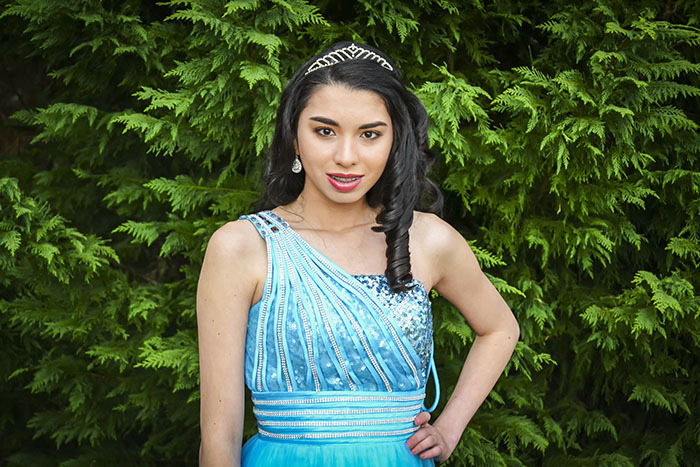 A couple of months ago I was invited to a Miss Teen U.S.A. Mystery Pageant birthday party. Once I called and did my RSVP I was given a packet containing my character. 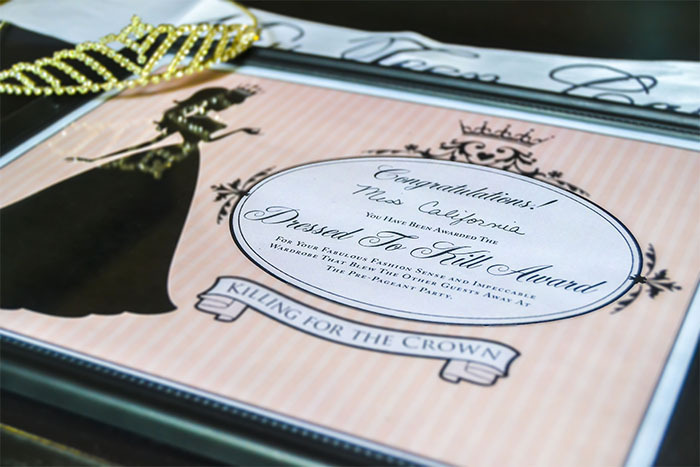 I was given Ms. California which was pretty cool. Ms. California is doing the pageant to make her mom proud. In order to do the pageant she got some plastic surgery done on her nose and she went to Ms. Teen Alaska’s spa to get it done. So of course I had to be cautious of Ms. Alaska to make sure she didn’t rat me out at the party. When I got to the party we were all given a certain space to sit and eat at. We had several meals and between each meal the waiter (birthday girl’s dad) would bring us a mint sherbet to cleanse our palates. Once we finished our meals we started the mystery pageant part. We were all given tasks to do and money to bribe others into spilling secrets. After we got the papers the lights went out and then one of the girls screamed. The lights came back on and then there lied a dead Ms. Texas among us. Everyone immediately got up and started questioning each other and threatening each other with “I will tell your secret” to find out who killed Ms. Texas. Everyone had something against Ms. Texas so everybody seemed like they were the ones who killed her. That made it kind of difficult to figure out who did it. Near the end all the girls were given the last couple clues. Ms. Texas had an affair with the past Ms. Teen U.S.A’s boyfriend. Also Ms. Texas was poisoned with green tic tacs. Looks like spear-mint is a pretty good weapon! I know, bad pun. A girl can only try. Later when the results were given everyone was dead silent and anxious to find out who killed Ms. Texas. The killer was… Me! Just kidding! It was Ms. Arizona, but it would have been pretty funny if it was me. I guessed that the killer was Ms. Teen U.S.A. because of how Ms. Texas had an affair with her man. What I missed was that the tic-tac bottle said made in Arizona. Good thing I’m not a detective because there would be a lot of unsolved crimes. Also near the end there were two different contests. One of the contests was who stayed in character the best and the other was who was best dressed. I was told about the best dressed contest and I was really shooting toward winning that contest. The birthday girl won the girl who stayed best in character with a good majority of the votes. I won best dressed with a majority of the votes as well. I was super excited to get the award because the award was in my area of expertise. Also before we left we were given goody bags that included tic-tacs, bobby pins, a nail filer, tissues, hand sanitizer, nail polish, and lip gloss. All things that a mysterious beauty queen will need in her every day life. 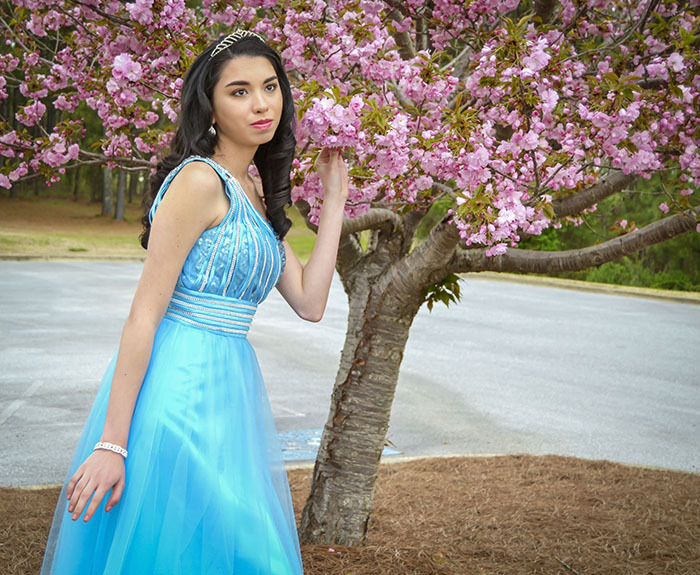 The invitation I was given told me to dress like a beauty pageant contestant so I wore the dress I wore to my 8th grade formal. The dress was a lace up dress so it still fit me pretty well. It’s an icy blue color which I love because the color is really pretty and it looks really good on me. The dress was an A-line skirt and one sleeved. I decided to wear flats to be comfortable that is why you can see in the picture that is a bit long. The jewelry was a simple silver and crystal bracelet and earrings that I got from Claire’s that looked expensive but fairly priced. I also wore my crystal tiara to match the jewelry as every pageant princess needs her own tiara. I even made my own sash because I thought we needed to bring our own, but they supplied us with sashes and tiaras at the party. Like I did for formal I made sure to curl my hair, except this time I did it myself. It really was. Loved the idea and had fun trying to find the mysterious killer. Muahahaha!